Why you procrastinate doing things you want to do. Why consuming (e.g., buying courses and clothes) feels like you’re really doing something and can be appealing. What it’s like to overcome fear and overwhelm to try something new, like running. Why it’s important to figure out the actual thought you’re thinking that’s stopping you from moving forward. Why thinking about looking stupid can be a dream stealer. How taking a baby step can be the most important thing you can do to move forward. Why Suzy decided to share her personal story about starting to run on this podcast! Welcome to another episode of The Women in the Middle Podcast! This week’s episode is a little different and I’m pretty excited to share it with you. Today we’re going to be taking a deep dive into MY brain and look at why I’ve been procrastinating and resisting something I’ve wanted to start doing…running. I called in an expert running coach to help me sort it all out and get me going. This episode gives you an inside look into what resistance to starting something new looks like. In my case, it’s running, but really, it could be anything, which is why I know you’ll identify with it too. And…, it’s a different spin on an interview because I’m the one who’s going to be sharing what’s going on in my mind that’s been getting in my way. 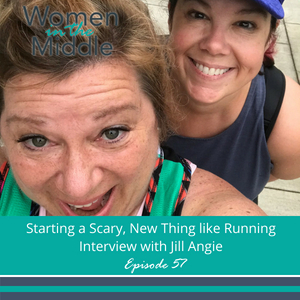 What you’ll hear is a pretty candid interview between Jill Angie, Life Coach and Running Coach at Not Your Average Runner (who you met in Episode 30), and ME, Suzy Rosenstein, a midlife gal who has been thinking about running for decades but is too afraid to get started. Jill and I have been talking about this idea for several months; we’ve been trying to figure out the best way to share this experience with both of our audiences. It turns out that last week was perfect because we were both at a conference called Podcast Movement 2018 and I was staying at Jill’s house. We knew we needed to record a podcast right then and there. So that’s what you’ll hear today. One of the reasons I love Jill is because she’s also a woman in the middle who is rocking her own business and doing new, scary things all the time. Jill supports women, no matter where they are in their running journey, and helps them “Run their Best Life.” Like I said, this is what I’m planning to do too. I know you’ll be able to relate to what it’s like to want to do something but come up with all kinds of excuses why you can’t or shouldn’t do it. Of course, as a Life Coach myself, I help my clients with mindset issues like this all of the time; but when it comes to ME, it doesn’t seem so straight-forward. You’ll hear the thoughts, the feelings and the plans for how to think through how to get started. If you’re dealing with procrastination, fear and overwhelm yourself, it will be super easy for you to tap into these insights and apply them personally. Everyone can benefit from coaching! 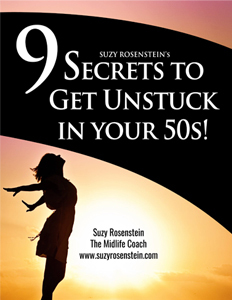 And at our age, as women in the middle, life is short, so let’s get going!